FAYETTEVILLE, N.C. (AP) — The river seethed a quarter-mile away, bulging from its banks, so the patrol cars circled the neighborhood three times. As the days drag on, Hurricane Florence has taken this deceptive turn: The violent winds that rattled shingles off houses and tore down trees have subsided, and the pounding rain has eased, lulling many in the storm’s path into believing they’ve already weathered the worst of it — even as rivers quietly churn and continue to rise. 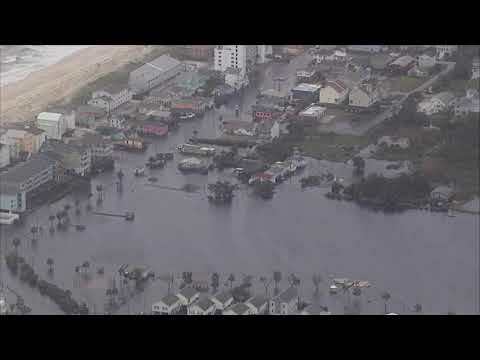 Aerial footage recorded on Monday shows the impact of Hurricane Florence on Carolina Beach. The storm has claimed more than 30 lives and an untold number of homes on its slow march across North Carolina, inundating city after city : Wilmington, New Bern, Lumberton. Now authorities are warning that by the time the Cape Fear River in Cumberland County crests Tuesday at 62 feet (19 meters) — 27 feet (8 meters) over its flood stage — it will threaten to swamp anything within a mile on either side of it. Its tributary, the Little River, is expected to flood, too. Military trucks in rural corners of the county barreled down dirt roads quickly becoming mud pits. “Please go,” soldiers asked stubborn residents along the massive river that curls downstream through small towns, farms and rural mobile home parks and into the city of Fayetteville, where the Reeses live in a subdivision that butts up against the bank. Over the weekend, a military truck rolled down the mucky lane to Kevin Blades’ house 20 miles (32 kilometers) upstream from Fayetteville, near where the Cape Fear and Little rivers meet. Savage said there is particular concern about this area. Six horses were drinking from floodwater already pooling on the front lawn. Power had been out for days. The dirt road to the house was so soggy, the truck got stuck in the mud and Blades and a neighbor had to tow it out. From Linden, the Little River ribbons west to a town called Spring Lake, where authorities shut down already-flooded roads and some who’d stayed put started to worry. In the tiny hamlet of Wade, population around 570, Athena Moore has been waiting out Florence in her mobile home a quarter mile (half a kilometer) from the Cape Fear River. Many of her neighbors cleared out, but she’s hosting two friends who fled from the coast as the hurricane roared ashore only to find themselves now in a flood zone. They’re all planning to stay, because they don’t have anywhere else to go.